China's offshore wind market has rapidly gained ground in Europe, and may soon be the world's largest. A landmark deal last week from France’s EDF signals that China’s traditionally closed renewables market may be opening to foreign developers, the Global Wind Energy Council’s strategy director said. Feng Zhao told GTM that an agreement between EDF and state-owned China Energy Investment Corporation, a leading industrial player in China’s electricity market, reflects a growing need for foreign resources to prop up China's ambitious offshore wind plans. 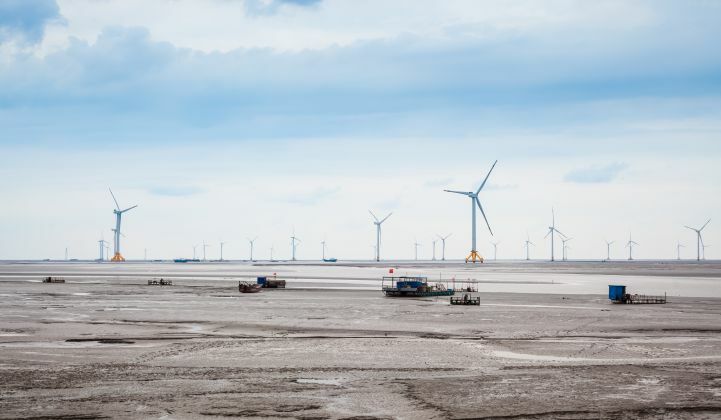 The deal saw EDF taking a stake in the Dongtai IV and V offshore wind projects off Jiangsu province north of Shanghai, surprising observers given the Chinese market has long been effectively a closed shop for foreign developers. Dongtai IV is already being built, and the construction of Dongtai V is scheduled to begin this year. Subject to the signing of the final contracts, both partners will build and operate a total installed capacity of 500 megawatts, which will be commissioned by 2021, EDF said in a statement. Zhao called the announcement “a turning point,” but added that the agreement made sense because EDF is seen as a trusted partner in the Chinese power market, where it has worked for many years on coal plant and nuclear reactor construction. EDF Renouvelables, which will be responsible for the Chinese offshore venture, already operates more than 310 megawatts of wind and solar capacity in China, the French company said. EDF Group has a hand in 5.3 gigawatts of offshore wind capacity worldwide, either in operation or under development. FTI Consulting, an analysis firm, expects China to become the largest offshore wind market in the world after 2021, with almost 10.9 gigawatts of cumulative capacity by then, pulling ahead of the U.K.
From 2019 onward, FTI Consulting predicts China will install 2 gigawatts per year, rising to 4 gigawatts annually by 2025. But China still lags far behind Europe in terms of offshore wind construction expertise. The Chinese offshore wind industry currently relies on fishing vessels for crew transfers, Zhao said, and health and safety standards are far lower than in Europe. “Looking at balance of plant alone, they are really behind the standard in Europe." The chance to move into what will soon be the world’s largest offshore wind market is likely to be a tempting proposition for European developers seeking to expand into new markets. Not all will find it easy to break into China, however. In particular, said Zhao, companies that have placed bets on the Taiwanese offshore wind market may be at a disadvantage owing to geopolitical considerations. A 3.8-gigawatt offshore wind auction in Taiwan last April attracted bids from Ørsted and Copenhagen Infrastructure Partners of Denmark, wpd offshore solutions of Germany and Northland Power of Canada. Ørsted is the world's leading offshore wind developer. Even if Ørsted and other Taiwan market bidders are excluded from China, there is still a good selection of European offshore wind partners for Chinese firms to choose from, said Zhao. They include the Norwegian firm Equinor, which is looking at offshore wind in South Korea, and Shell. Shell has made no secret of its offshore wind ambitions and last October chose the China Wind Power 2018 show to announce it was joining the Global Wind Energy Council. Chinese regulations mean any foreign developers will only be able to take minority shareholdings in offshore wind projects, Zhao said. And while China’s developers will no doubt look first at how well European partners can supplement local supply chains, Chinese firms will also likely have an eye on possible expansion opportunities beyond their home market.